DETROIT -- Johnson Controls Inc. is bringing component work in-house and experimenting with shorter factory workweeks to deal with massive worldwide vehicle production cuts in the first half of the year, said JCI Automotive President Beda Bolzenius. Interviewed after a press conference here at the Detroit auto show, Bolzenius said JCI is looking to shift component production from suppliers to its factories to use that capacity better. Components include seat structures, welded parts, stampings and others, he said. The shift of parts making to JCI also protects the company from potential production interruptions that could crop up due to a strained North American supply base, Bolzenius said. Make-or-buy decisions are being judged differently from a year ago, he said. Bolzenius said he has never experienced the type of vehicle production cuts and consumer uncertainty wreaking havoc with business plans. North American vehicle cuts are pegged at about 25 to 30 percent, he said. Bolzenius said the key is flexibility. JCI has started cutting some workweeks in Europe to three and four days, including a 2-3-day arrangement at plants in Spain. No North American plants have yet gone to that setup. 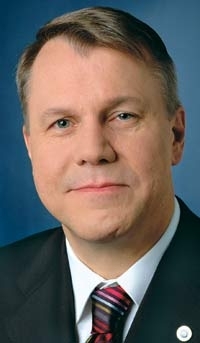 But JCI has cut shifts and work force to align its plant production with that of customers, Bolzenius said. JCI cut its worldwide capital spending budget by more than one-third in 2009 to $600 million to $650 million, Bolzenius confirmed. The largest cuts occurred in its automotive budget, he said. The automotive division of JCI is one of three units. That division is among the healthiest auto suppliers in the world -- the company is one of only three North American suppliers still rated at investment grade by Standard & Poors. But it is growing slower than JCIs energy management and facilities segments. At the press conference, JCI premiered its re3 concept, a small car that highlights several JCI technologies, including a plug-in hybrid system. JCI is a leader in conventional and lithium ion batteries. The lithium ion battery pack is located between the front seats where a console is traditionally located. The position opened storage space in the trunk. The re3 also features a touch-screen instead of an entertainment center stack and ultrathin seats to open legroom. The passenger front seat also slides all the way to the back seat so the passenger can conveniently converse or take care of an infant in the back. JCI ranks No. 7 on the Automotive News list of the top 100 global suppliers with worldwide sales to automakers of $18.50 billion in its 2007 fiscal year. DETROIT, Jan. 11 /PRNewswire/ -- For Johnson Controls , a major goal is finding new opportunities to help its customers succeed by creating "smart" environments. In terms of vehicles, this means creating products that bring value today -- reducing weight, optimizing cost and providing sustainable solutions that generate consumer appeal. With the debut of its re3 concept vehicle at the 2009 North American International Auto Show (NAIAS) in Detroit this week, Johnson Controls demonstrates its strong capabilities and latest innovations in product and process technologies targeting the growing small car segment. The re3 exemplifies a smart environment that has three key elements: re:think -- shifting the paradigm of what a small car should be, enabled by innovative engineering; re:new -- providing an interior based on the core principles of sustainability; and re:spond -- presenting a holistic experience that generates strong consumer appeal, through a focus on human machine interaction (HMI), comfort and interior ambiance. It is on display this week at the NAIAS, as part of the Johnson Controls product and technology exhibit in room D2-15 of Cobo Center. -- Eco-friendly, renewable materials with "natural look" finishes throughout the interior. "Our re3 concept shows how we can redesign and improve the interior of a small vehicle to meet the needs of consumers while adding tremendous value for our customers," said Jeff Williams, group vice president and general manager, North America for the Automotive Experience business of Johnson Controls. "People want smaller vehicles with better fuel economy, eco-friendly materials and the luxuries and utility that make the driving experience enjoyable, and the re3 is a great demonstration of our ability to help meet these needs through innovation." To "rethink" the small car, Johnson Controls designers used a process that provides a systematic approach for optimizing value, and increasing the availability of features not usually found inside a small model, so it doesn't feel like an economy car. The Johnson Controls team looked at the concept from a "clean sheet" perspective, made decisions about what was most appropriate, and then optimized performance. In developing the re3 concept, company designers sought to provide seating for five in a plug-in hybrid vehicle; significantly reduce mass and optimize cost; integrate many desirable interior amenities; develop the concept globally; and deliver a vehicle that is customizable to various markets around the world. The "renew" element of the re3 concept includes a lithium-ion, plug-in series battery that powers the vehicle, as well as renewable materials that are lighter in weight than conventional materials, and offer a "natural look" finish on various interior components. Energy storage was a critical factor, with the battery placed between the front seats in the center of the vehicle to maintain a low center of gravity and maximize the distance to the perimeter of the vehicle. This also allows for maximum rear cargo storage and three passengers in the rear seat by utilizing the space between the two front seats in the center tunnel. The battery system is sized to provide enough energy so that most commutes can be done on electric drive, and is designed with active cooling and electronics to maintain the optimal operating condition. Through its joint venture Johnson Controls-Saft, the company opened the world's first production facility for lithium-ion hybrid vehicle batteries in Nersac, France in 2008. From a sustainability perspective, the re3 provides significant mass reduction, renewable materials, and smart features that enable efficiency. In the cockpit and on the door panels, surfaces are comprised of exposed natural and environmentally friendly substrate material with a fiber-wood appearance, giving the vehicle a handsome, organic feel. By eliminating the A-surface material, a 30 percent weight reduction was achieved. Also by reducing the number of plastic parts in the interior, the use of petroleum-based materials was decreased. To "respond" to consumer demand, the Johnson Controls re3 concept offers compelling HMI; redefined seating architecture; industry-leading levels of storage; and unique packaging of a lithium-ion battery -- all in a small car environment. The Johnson Controls Ecospace instrument panel technology helps to make the cockpit area more spacious, with an open architecture structure that safely allows for unprecedented storage volume across the front of the instrument panel. This innovative structure is based on a hybrid (plastic/metal) construction, which generates weight and cost benefits and opportunities to integrate more functions. As a result, designers achieved a 26 percent weight reduction in the instrument panel. In the re3, the center stack controls have been eliminated, reducing the number of switches and freeing up space. The infotainment and HVAC (heating, ventilation and air conditioning) functions have been reintegrated into an extended instrument cluster and a seat-wing on the driver's seat. Integrated into the extended cluster are two reconfigurable displays that allow the placement and delivery of information based on the driver's needs. One of the displays -- with a 4.3-inch screen -- is located in the center of the cluster. The other one is an outboard-mounted, high resolution, 7-inch display. Reorganizing the information shown is accomplished by a simple "touch and flick" operation, allowing the driver to manage information such as messaging, navigation, mobile commerce, vehicle diagnostics, energy consumption and vehicle / trip range. The driver-side functional seat-wing is ergonomic, providing controls that are used most often for HVAC and music management within easy reach of the driver and passenger. The enhanced HMI includes innovations such as the Johnson Controls Mobile Device Gateway with E-Bin, and Mobile Commerce with Card Reader. The Mobile Device Gateway adds convenience by linking mobile electronic devices -- such as mobile phones, navigation devices or music (MP3) players -- to the vehicle and allowing the driver to use the devices intuitively, safely and easily. Mobile Commerce is a product that allows consumers to securely pay for mobile purchases and services while traveling -- including fuel, parking, meals, entertainment and other goods --using their credit card or mobile phone while in the vehicle. The E-Bin is a space to place mobile electronic devices in order to establish power and data connections, as well as the location for a credit-card reader. Conversational seating is another innovation inside Johnson Controls' re3 concept. It is enabled by the company's next generation, lightweight MS structure. The passenger front seat slides backward into the second row, facilitating a more inclusive conversation with the rear passenger, or allowing the passenger to attend to a child more easily. The concept's front seats include Johnson Controls' Slim Seat technology; the riACT head restraint system that reduces the risk of whiplash injuries and meets safety regulations; vibration-dampening VT Foam produced with natural oil polyols; and "green" trim materials. The Slim Seat has a thin- profile seat back, providing the same level of comfort as a conventional vehicle seat via the Johnson Controls Comfort Shell technology. The Comfort Shell is a patented technology that enhances comfort through the use of a flexible panel in conjunction with the company's VT Foam. In its second row, the re3 features the Johnson Controls stadium style, slim style, 60/40 flat- folding seat; and the company's FaserTec foam pads. The re3's overhead system is optimized and offers a 30 percent weight- reduction opportunity. It includes Johnson Controls' C-Lab Visor, which is lighter than conventional visors and reduces cost; a headliner substrate with natural material content that is lightweight and acoustically absorbent; fabric covered, compression-formed garnish trim that weights 50 percent less than a plastic injection molded part. A Functional Film Overhead Console reduces part count and complexity. Williams says that nearly all of the Johnson Controls products and innovations included in the re3 concept are available for production now, and can be integrated into the next generation of vehicles. Johnson Controls is the global leader that brings ingenuity to the places where people live, work and travel. By integrating technologies, products and services, we create smart environments that redefine the relationships between people and their surroundings. Our team of 140,000 employees creates a more comfortable, safe and sustainable world through our products and services for more than 200 million vehicles, 12 million homes and one million commercial buildings. For additional information, please visit http://www.johnsoncontrols.com.